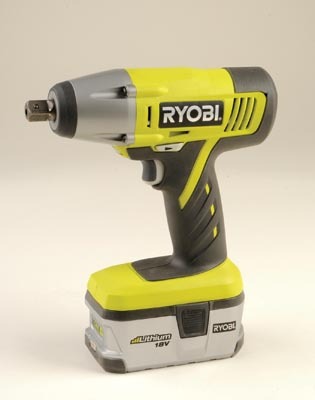 This powertool is part of the new lime green/grey livery range from Ryobi aimed more at the domestic, rather than trade market. This range has new casing designs including plenty of rubberised grip areas for comfort and safety in use. The 18v Li-ion batteries don't look a lot smaller than the old NiCd range but this means they should have loads of capacity. These batteries must be used with the new intelligent chargers that indicate battery status. Impact wrenchs are a growing phenomenon as manufacturers try to find new products to entice us with. I must admit an impact wrench isn't on my list of priorities but it could have its uses. Driving really big galvanised hex-headed coach screws is probably what this machine would be most useful for in woodworking terms. So that's what I set out to do: drive big coach screws without any pre-drilling to see how powerful the tool is. Although most of the force is absorbed by the design of the drill and the rubberised grip, there is a noise level that gets irritating, so ear protection is wise for prolonged use. The drive shaft will take standard 1/2in sockets which I used by matching them to the heads of the coach screws. In thick, treated softwood, it dealt with 100-125mm coach screws with ease, while it got halfway in with the biggest 150 x 12mm shanked type. The impact action is persistent and the tool has just a single drive speed. Fine metal flakes were shed from the coach screws the longer I was driving them in. On a tough old oak post, a coach screw already stressed from soft driving, no doubt, snapped flush to the timber. 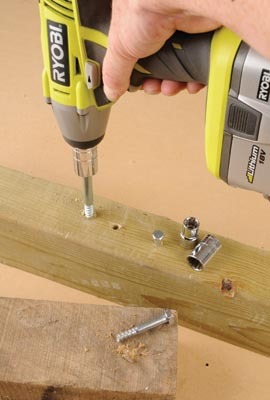 In short, this Ryobi 18v impact wrench has plenty of welly for most situations, just don't over-use it or the very things you are fitting or removing might give up on you first, and removing a broken screw is pretty hard to do.